Welcome back, my Cutting Edge Stencils friends. 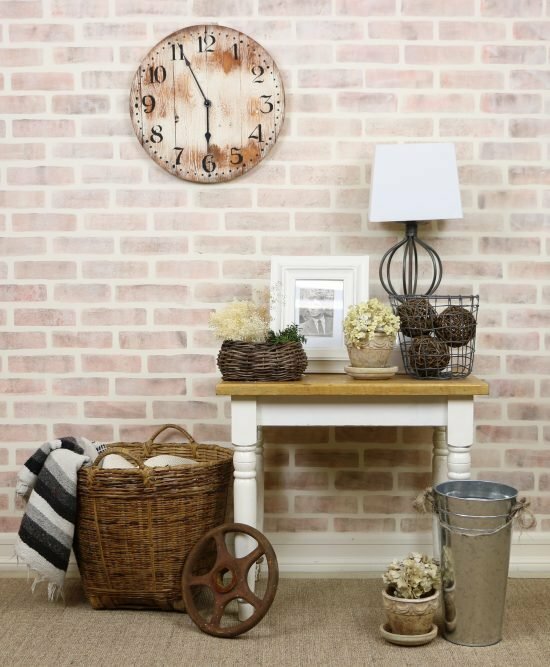 Nothing completes the look of your charming country decor than a farmhouse wall clock. Our stencil patterns can help you craft the perfect farmhouse clock. Create the personalized farmhouse clock of your dreams in just a few easy steps using our Old Farm Clock Wall Stencil. We’d like you to welcome back Erika, the in-house creative guru at Cutting Edge Stencils. Not too long ago, Erika built a farmhouse clock using some old fence wood. In that tutorial, we mentioned that the fence wood had been scooped up from a garbage pile at the curb. 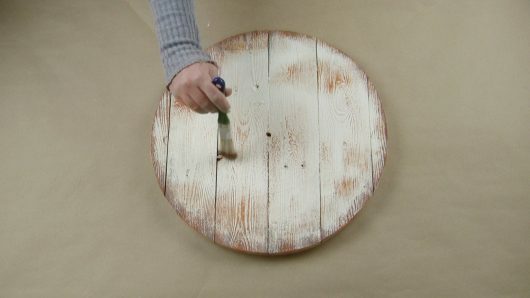 You can see how the round wooden base was built in this post, How To Make a Farmhouse Clock. 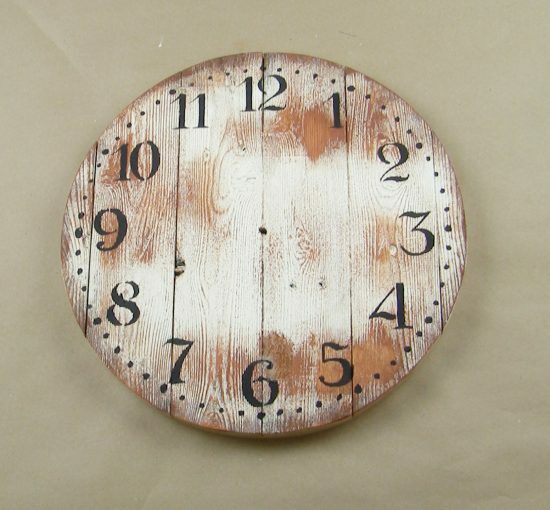 Since Erika had extra wood, she used it to make this distressed farmhouse clock. 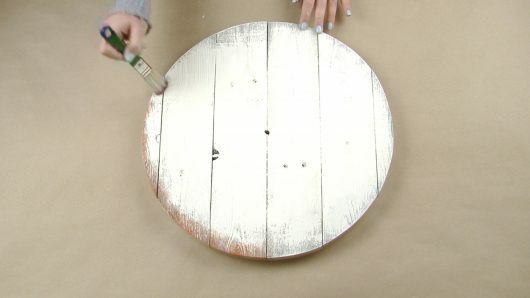 The first thing she did was dry brush the round wood using Navajo White by Benjamin Moore. 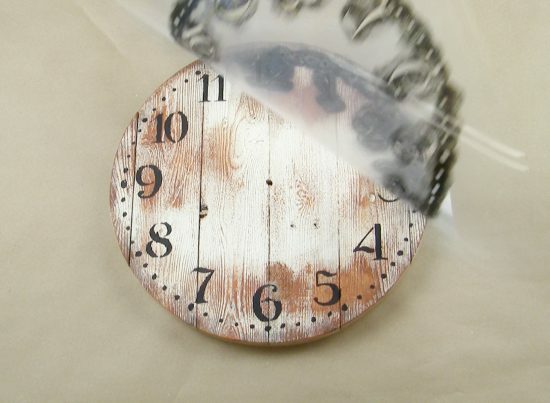 Erika wanted the clock to have a distressed look so she applied a rusty brown paint color on top of the white. She dipped a small chip brush into the brown paint (Benjamin Moore Satchel). Then Erika brushed off the excess paint onto a piece of paper towel. When the paint brush had just a little bit of paint on it, she ran it over the wooden canvas. Once Erika was happy with the distressed appearance of her wood, she was ready to start stenciling . 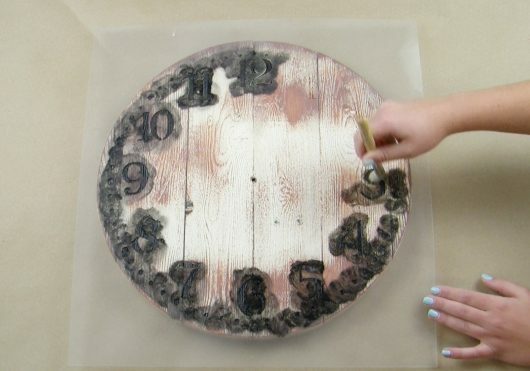 For this project she planned to use the Old Farm Clock Stencil. She sprayed the back side of the stencil with repositionable spray adhesive. We like to use Sticky Note Spray Adhesive found on Amazon. 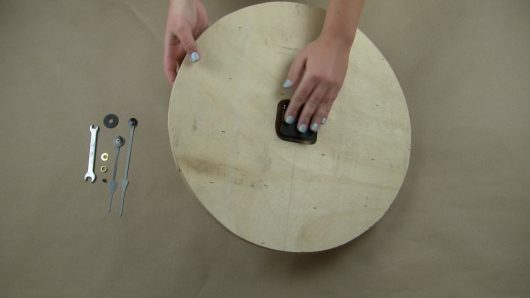 Then she positioned the stencil on top of the painted wood circle and painted the pattern in Benjamin Moore’s black using a stencil brush. She made sure she brush off any excess paint on a piece of paper towel. Too much paint will cause the design to bleed. Once the entire design was painted, Erika lifted the stencil back to reveal the pattern. To complete the farmhouse clock, Erika used a clock movement kit that had been purchased from Amazon. She attached the clock hands according the directions included in the package. 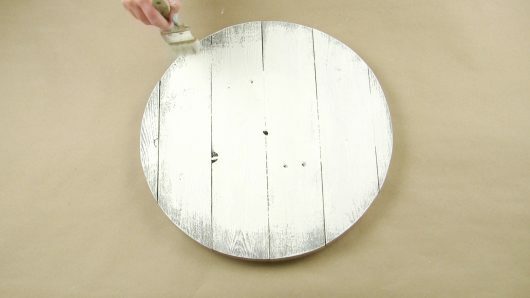 Are you ready to see how Erika’s distressed farmhouse clock turned out? Here it is! We are amazed that old fence wood could craft such charming wall decor. This farmhouse clock has homemade character that completes the look of this rustic space. 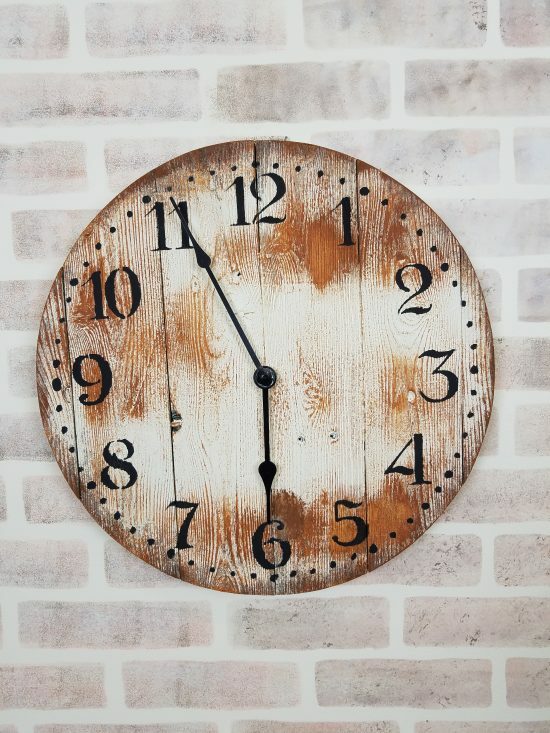 Tell us, where in your home would you use the Old Farm Clock Stencil pattern? Leave us a comment below, we’d love to read your thoughts! Our Favorite Stencil Projects of 2015!